The scalable California map on this page shows the state's major roads and highways as well as its counties and cities, including Sacramento, California's capital city, and Los Angeles, its most populous city. To display the map in full-screen mode, click or touch the full screen button. To zoom in on the California state road map, click or touch the plus (+) button; to zoom out, click or touch the minus (-) button. To scroll or pan the zoomed-in map, either (1) use the scroll bars or (2) simply swipe or drag the map in any direction. (The scrolling or panning method you use will depend on your device and browser capabilities.) At any time, you can display the entire California road map in a new window or print this page, including the visible portion of the map. California's primary Interstate Highways connect its major cities and facilitate travel between California and its neighbors. From its southern terminus at the Mexican border, I-5 runs northward through California to the Oregon border, passing through San Diego, Los Angeles, and Sacramento. From its western terminus in San Diego, I-8 runs eastward, leaving the state at the Arizona border. From its western terminus in Los Angeles, I-10 runs eastward, leaving the state at the Arizona border. From its southern terminus in San Diego, I-15 runs northward, leaving the state at the Nevada border. I-40 enters California at the Arizona border, running westward and connecting to I-15 near Barstow. In northern California, I-80 enters the state at the Nevada border, near Reno, continuing westward though Sacramento and Oakland to San Francisco. California's auxiliary Interstate Highways, identified by 3-digit numbers, serve urban areas of the state. I-110, I-210, I-215, and I-405, I-605, and I-710 serve the greater Los Angeles area. I-110, I-605, and I-710 all traverse cities southeast of Los Angeles in a northerly direction from their termini near the Pacific coast. I-210 traverses suburban cities just south of the San Gabriel Mountains, between its western terminus at I-5 and its eastern terminus at I-15. I-215 traverses outlying areas east of I-15 between Cajon Canyon in the north and Murrieta in the south. I-405 parallels I-5 through the coastal areas of Los Angeles and Orange counties. I-280, I-580, I-680, and I-880 serve the San Francisco Bay Area. Starting in San Francisco, I-280 runs southward through San Mateo and Santa Clara counties to San Jose. I-580 runs between Marin County near San Rafael and I-5 in the San Joaquin valley. I-680 traverses Contra Costa and Alameda counties, running between I-80 at Fairfield and the city of San Jose. Starting in Oakland, I-880 runs southeast through Alameda and Santa Clara counties. I-505 serves the greater Sacramento area. From I-5 northwest of Sacramento, I-505 runs southward to connect with I-80 near Vacaville. I-805 serves the San Diego area. Running from I-5 near the Mexican border and rejoining I-5 in the Sorrento Valley, I-805 bypasses downtown San Diego. There are so many spectacular road trips through this beautiful state that it would be impossible to highlight them all here, but a few include the Pacific Coast Highway, Yosemite, and the Big Sur Coast. 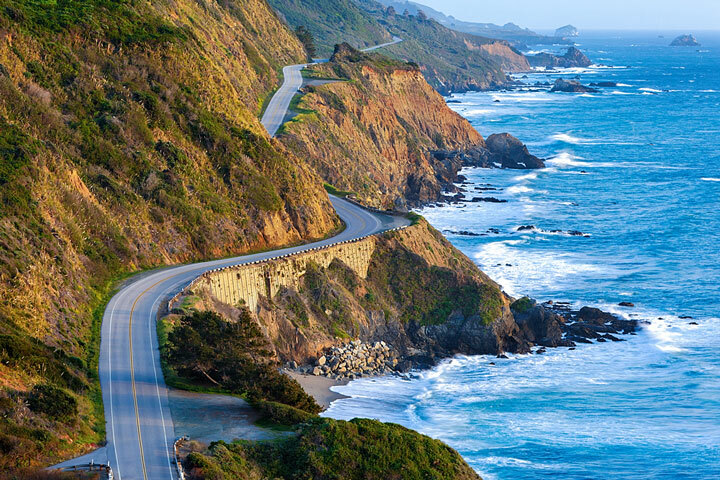 Coastal Route 1 is known as one of the world's most scenic highways and offers otherworldly views of the breathtaking Big Sur Coast driving north from San Luis Obispo to Monterey. In addition to enjoying cliff-top ocean views, tour the outlandishly opulent castle of publisher William Randolph Hearst in San Simeon and make a stop at Carmel-by-the-Sea, a quaint village loved by poets, novelists, and artists of all types. More information about scenic roads in California is available on this America's Byways: California page. For more information about California's roads and transportation infrastructure, visit the California Department of Transportation website. For California road traffic conditions, visit the Federal Highway Administration's California Traffic Information page.